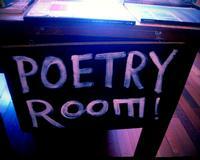 Welcome to Poetry Room blog post #2. Remember the whole “poetry is weird and difficult and often written with seemingly hidden clues designed to stymie the average reader” theme from our last post? Let's talk more about that weirdness. Let's discover some off-the-wall poems. Poetry doesn't have to be the stuff of legend, ecstatic love, or supreme tragedy. In fact, some of the best work out there gets at those themes without the heralding trumpets and star-crossed lovers. Take Charles Simic for example. The Yugoslavian-born poet, in addition to being prolific, has a great talent for the strange. Here's one of his more famous poems, "Fork". A, uh, poem about a fork, huh? But don't you love how eerie it is, how he gets you thinking of birds, and being a carnivore, and medieval clan battles? (Okay, maybe that last one is just me.) In addition to the barrage of imagery suddenly linked to everyday cutlery, there's also an emotional resonance here, an uneasiness resulting from the last lines, where he ties the fork and meat back to your own body, your own self. How did he do that it nine short lines? Therein lays the crux of a good poem: clear images and a single bell toll that arrests your senses. Another poet known for his weirdness is Russell Edson. Sadly, Edson died last year, so I wanted to give him a special shout out. Perhaps the best known prose poet, Edson is interested in narratives that lead you down paths of seeming nonsense, into little worlds where bizarre things happen. Like this one, "Let Us Consider". "Eh.... let us consider that you're a scary loon, Mr. Edson!" you may be thinking. What I love about this and other of Edson's work, though, is his willingness to go deeper and deeper into the creepy life of the poem. There's no secret message here; it's a fantasy, of sorts. Shall we take a moment to do what the title of the poem asks us to do, consider? Instead of being ridiculous, aren't the characters that inhabit this poem actually a bit sad? And when we realize they’re sad, don't we feel a little sorry for them, maybe a little akin to them, too? Maybe, after all, I'm not that different from the man about to eat his fedora. Wait, what? How did I get here? That's what Edson will do to you. RIP, you crazy mastermind. So, what do you think? Did you know poetry could be like this? I hope you're happy that I haven't made you read any Petrarchan sonnets (no disrespect to the Petrarchan sonnet, the forebear of so much poetry awesomeness) or five-pagers about Orpheus and Eurydice (who??). If you were intrigued by Simic or Edson and want to read more, click on their names to follow the link, then click on the “Poems, Articles, & More” tab. Hit me up with your thoughts about this blog series. Anything you want to know, deride, praise about poetry? In the meantime, keep it weird. why don't you take me to Funky-TOWN ! !